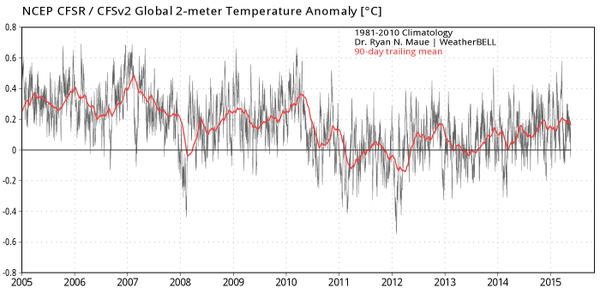 Satellite temperature records that offer the most comprehensive and accurate measurements show no statistical warming for nearly 19 years and counting. Yet, based upon tweaking of near-surface ocean temperatures earlier this year, the National Oceanic and Atmospheric Administration (NOAA) surmised that this “pause” of pending human-caused climate calamity doesn’t exist. As in the past, this tinkering of spotty and unreliable surface data by NOAA and other government agencies always seems to conclude that past temperatures were cooler than actually documented, making recent trends appear warmer. The latest data revision involves upward adjustments of superior readings taken from ocean buoys to match random and haphazard measurements obtained by ship crews. Distinguished Georgia Tech climate scientist Judith Curry confirms that the recent NOAA study headed by Thomas Karl didn’t use the best available ocean data. Incidentally, surface climate data reports represented by NASA’s Goddard Institute for Space Studies (GISS) are no more reliable than NOAA’s, and likely far less. It was revealed earlier this year that nearly half of their recently alleged global warming claims resulted from highly suspicious statistical changes . . . not from actual temperature readings. This shouldn’t be particularly surprising in light of the fact that NASA-GISS was previously headed by mainstream media’s celebrated climate doom and anti-fossil energy activist James Hansen. Time and again we are warned that a latest month or year is the “warmest on record,” claims typically based upon temperature differences many times smaller than either NASA’s or NOAA’s cited margins of error. In August, both agencies announced that July 2015 was the hottest month since instrumental records began in 1880. NOAA asserted that this record beat out July 1998 by eight one-hundredths of a degree Celsius (0.08º C), yet with an uncertainty of 0.014º C. NASA-GISS records indicated that July 2015 edged out July 2011 by 0.002º C.
Similarly, President Obama proclaimed that 2014 held a feverish record (with only a 38% probability and by infinitesimally small margins) over 2010, 2005, and 1998. NOAA has steadfastly refused to turn over much of the basis for its research deliberations along with related internal communications even to Congress. Last July Rep. Lamar Smith (R-TX), who chairs the House Science and Technology Committee, subpoenaed NOAA for the latest research records. While NOAA has provided Rep. Smith’s committee with limited publicly available data and has briefed staff on some aspects of their research, the agency insists that it has no intention of handing over documents that reveal its internal deliberations. We might readily understand why many NOAA scientists would fervently wish to protect confidential discussions. A painful lesson can be drawn from the release of scandalous ClimateGate emails revealing previous deliberative data-rigging discussions. One email string discussed “Mike’s [journal] Nature trick” about how to hide the temperature decline. 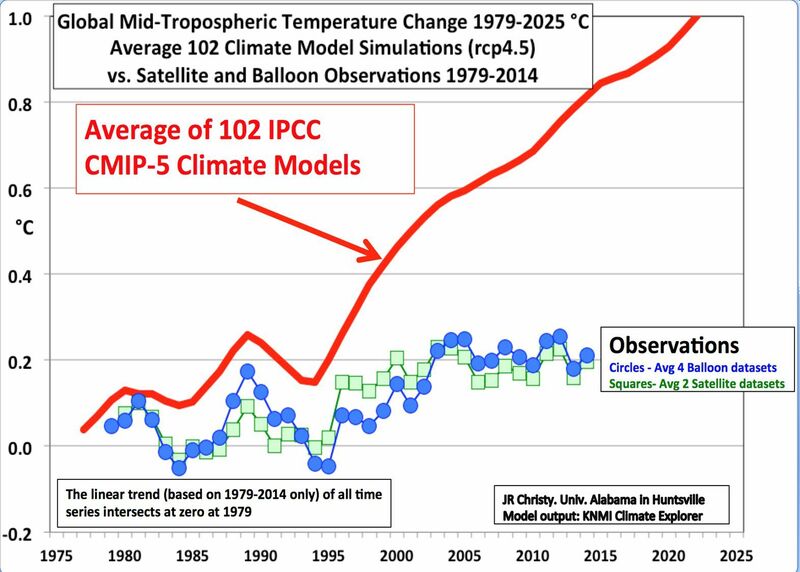 This exchange referred to Michael Mann’s infamous “hockey stick” graph which showed recent temperatures catapulting off its cobbled-together chart. That now-debunked knuckle-biting sensation has since even been dropped from alarmist UN Intergovernmental Panel on Climate Change (IPCC) reports,which had originally featured it as a cause for drastic and immediate actions. Nevertheless, mythological “settled science” climate doom continues to dominate international energy policies. Given the many billions of dollars that the junk science-premised global warming industry is costing U.S. taxpayers and energy consumers, a cooling dose of Congressional scrutiny is warranted and vital. But don’t expect any such investigation to end politically purposeful government agency manipulations which have revised temperature data between 1880 and 2010 a total of 16 times during the past 3 years alone. Yes, man-made climate changes pose real threats. We can count on them to continue so long as UN wealth redistribution and crony capitalist “alternative energy” subsidy agendas reward super-heated science representations. Why does congress even have to ask for their emails? My company doesn’t have to ask for my company emails. If they want them they just have the administrator take them… they belong to the company. These emails belong to the government, they should just take them. If congress can’t order NOA to deliver them, Lamar Smith should ask Anonymous to hack NOA for the records and release them to congress. Anonymous is ‘NATO’ I will speculate since they are funded mainly by us and for us through us! November 18th, 2015 The Climate Talks in Paris will Fail: Why? As expectations build for a global consensus to emerge from the United Nations climate conference in Paris, starting on 30 November 2015, that could agree to taking action to limit any rise in global temperature to 2 degrees celsius, I would like to explain why these expectations are misplaced. And what we can do about it. The essence of the problem is that most people and organisations are asking elites to take action on their behalf rather than taking action themselves. Why are so many of the deniers of the theory of human caused climate change from Texas? I wonder if all the money contributed by Exxon and Koch to CFACT has any effect on the spin that comes out of it. It is grossly ironic when the fossil fuel crowd says the other side is in it for the money! There are many variables of course but part of the reason is related to education level. Texas ranks near the bottom (or at the bottom according to some studies) for highshool graduation rate in the US. Satellite temperature records that offer the most comprehensive and accurate measurements show no statistical (sic) warming for nearly 19 years and counting. Dishonest statement, with no evidence. And the satellite people say surface data are better, so bumbling Larry is stumbling around, looking for play. I hope Morano doesn’t pay Larry for this poorly-written drivel. As always, you present no valid information, just dishonest, “green” activists BS opinions. Both satellite data-sets are confirmed by weather balloons, not one, not two, not three, but 4 sets and millions of measurements. This makes me wonder, do you understand what evidence is? What empirical data is? 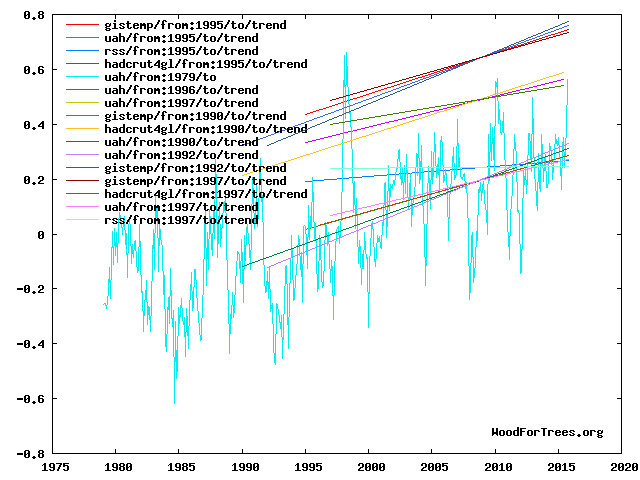 Sea level fraud; https://roaldjlarsen.files.wordpress.com/2015/07/nasasealevel1982vs20151.gif Why cheat if there’s really a problem? And peer reviewed science by the global warming alarmists themselves confirm that the satellites are the most comprehensive and accurate method to obtain a global average temperature. The climate alarmist trolls will play their games, obfuscate, repeat their propaganda, but they can’t and won’t rebut this empirical science, because their whole religion is based on flawed, faulty, falsified, failed climate models which can’t accurately project future global temperatures at even the 2% confidence level. (vonStorch2013) It is insane to implement draconian climate policies on such flimsy support. 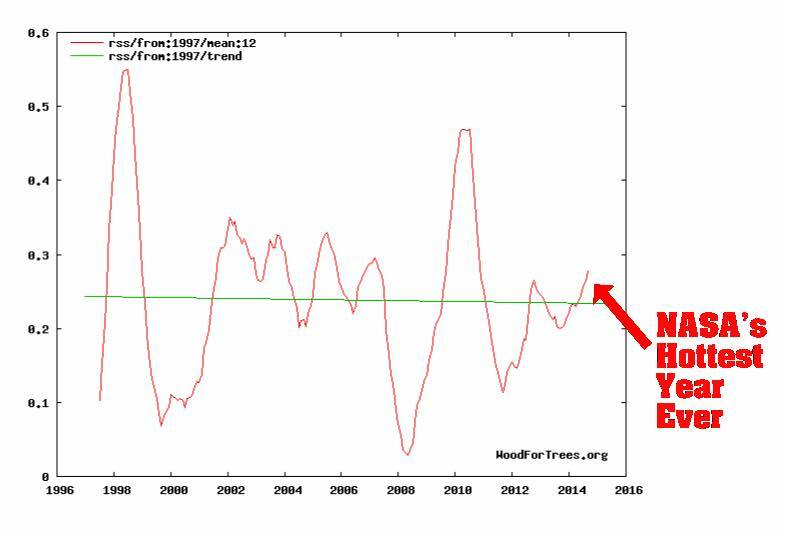 This is why the sea surfase temperature doesn’t go up .. https://roaldjlarsen.files.wordpress.com/2015/08/temp2.png The earth isn’t warming. Of course it will be the warmest on record, no point in cheating if you don’t get the result you need ..